Editor’s Morning Note: Tech discovered that money can buy things, like influence. 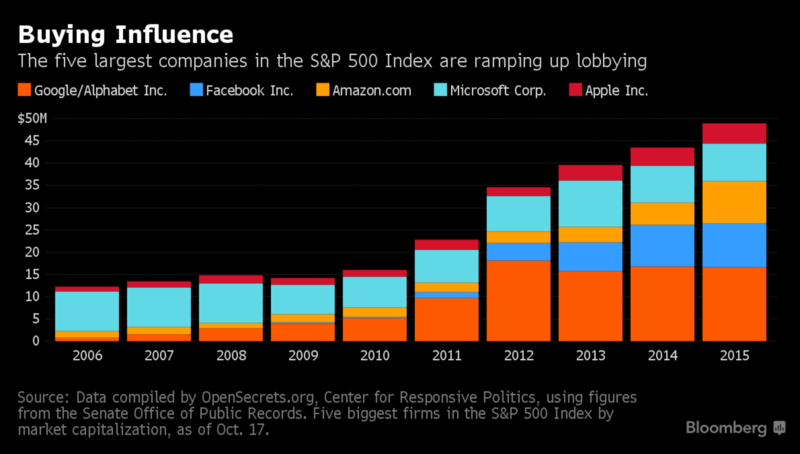 Major technology companies are spending record sums to influence the government. According to Bloomberg, leveraging data from the Center for Responsive Politics, the five largest technology companies “spent $49 million on Washington lobbyists last year.” This is much more”the five largest banks shelled out,” which didn’t even crest the $20 million mark. I can’t find the source of the quote at the moment, but to paraphrase: tech goes politics, politics is going tech. The worlds of tech and politics may be a continent apart, but they are increasingly commingled. The fate of net neutrality will be set by the results of the current Presidential election; If Sec. Clinton wins, it will likely be maintained. If Mr. Trump wins, it will likely be deleted. The multi-billion dollar spectrum auction, cutting up the airwaves for future use (data transmission, etc). The NSA forcing Yahoo to compromise its own security to assist government snooping of user data. Government oversight of technology M&A, especially as we head into the Turn of the Business Cycle. The general availability of uncompromised encryption technology. The hacking of one of the major political parties, potentially by a state actor, and the constant leaking of supposed private communications. Consumer data use, and sale. Bitcoin and its ilk, and the place of virtual currency in the modern banking world. Data residency, and if Microsoft should be forced to turn over foreign-located data to respond to US-based authorities. 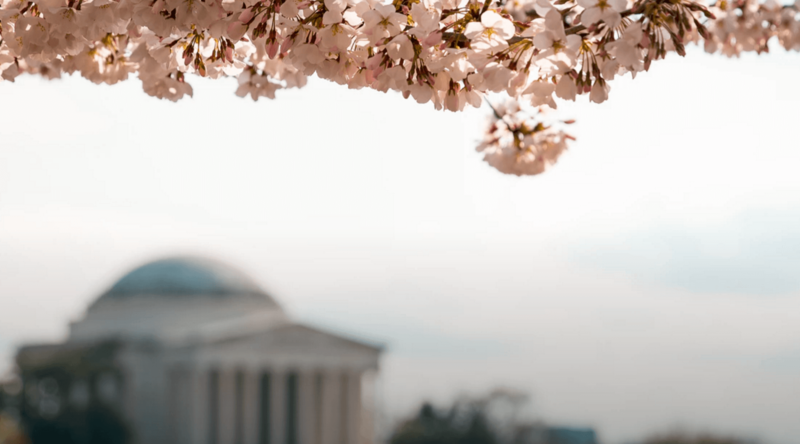 Carried interest taxation as it relates to the venture capital industry. Marijuana legalization, and how it may impact tech startups like Eaze and Meadow. Labor classification as it matters to the Gig Economy, especially how it relates to giants like Uber. Rules regarding going public, non-GAAP financial reporting, adjusted revenue, and retention. Oversight of new drugs and biotech oversight, especially in the wake of Theranos. And so forth. That’s just a nibble of what’s going on between Dupont Circle and Menlo Park. That in hand, our chart makes reasonable sense—almost. The increasing sums seem reasonable. If your firm, or industry, had the same amount of surface area to the government, you too would pocket out. What does confuse, of course, is how for so long the tech industry worked to stay largely out of politics. (At least that’s what I’ve been told.) The small-ball sums listed from 2006 to 2010 underscore that point. Tech didn’t play the game, leaving it to the odd folks on the East Coast. No more. Tech companies make banks look poor. That they are outspending them on influence purchasing isn’t surprising. It’s actually so boring we can call it a reasonable use of shareholder funds to ensure stable future relations. “Petty fights” might have been better phrasing here. “Barkish bites?” “Humid nights?” Oh well. DC. You know what I mean. Note that Microsoft was nearly all the send from the Big 5 in 2006, 2007, and 2008? That’s because Alphabet was a much smaller Google, Facebook was a private upstart, and AWS wasn’t what it is today; keep in mind the historical arc of each firm from the above, and you’ll see that the data set isn’t as good as it might be. It might be more effective to track the aggregate spend from the five largest tech companies, regardless of name, over time. For today, however, this chart suffices.